Our parent organisation, the European Music Archaeology Project (EMAP), is organising a doublepipe school in Tarquinia, Italy, 3–6 May 2018. For the programme and further information on the Euterpe school, see www.emaproject.eu/events/euterpe. 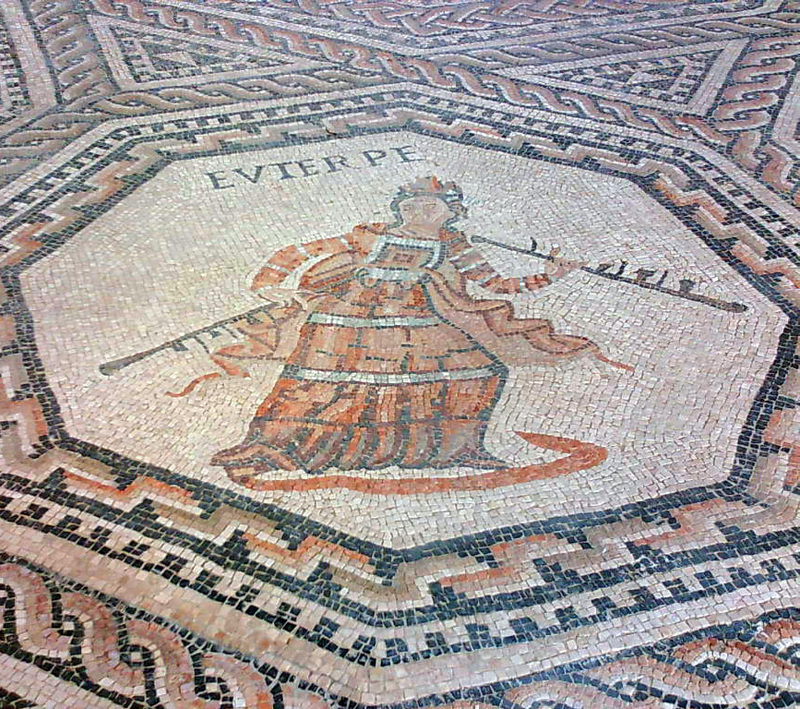 Euterpe is the Greek muse of music, commonly represented playing a doublepipe. The Roman mosaic above (c. 240 CE in Vichten, Luxembourg) shows her playing a mechanised tibia. We dream of playing an instrument like this in a future Euterpe school! A detailed timetable will be published in mid-April, when registration closes. Meantime, please help us spread the word by sharing the Euterpe 2018 prospectus. We are particularly keen to reach woodwind players in conservatoires, universities, jazz schools and traditional music schools. Anyone is welcome. You don’t need to bring an instrument: on the first day, we’ll be making simple Ur pipes that you can take home. These narrow-bore pipes are ideal for practising quietly and for learning circular breathing. They are based on Bo Lawergren’s study of a find from 2450 BCE. Below is a reconstruction by Marco Sciascia, hammered from solid silver in 2016. I made the reeds using Arundo donax that I cut in September 2014, while on holiday near Girona. The Euterpe school is associated with two websites. Let me explain the difference. For discussion and work-in-progress, you can follow developments here in the Workshop of Dionysus (www.doublepipes.info). This is a workshop. We get our hands dirty, experimenting, sharing drafts. It’s OK to make mistakes: we learn by getting things wrong in a supportive environment, one that understands the benefits of interdisciplinary collaboration. Everyone can get involved, contributing to the evolution of ideas. What matters here is: 1) creativity breaking new ground; and 2) a spirit of generosity, curiosity and respect for other people’s ways of thinking – both in the distant past and in other cultural and professional spheres today. The focus of the Workshop of Dionysus is the revival of doublepipes. The EMAP website (www.emaproject.eu) differs in that it covers a whole cornucopia of musical instruments and has no discussion. Milestones in the doublepipe revival are frozen on the EMAP site from time to time, together with milestones from other strands in our parent project. If you want to get involved in testing and developing doublepipe learning materials, the action takes place here. I look forward to vigorous discussion of the Euterpe school materials between now and May! Pages with information for participants and ‘milestone’ scores, the provisional results of ongoing experiments, will be at www.emaproject.eu/events/euterpe. Do join us if you can! If not at Velcamare, then in conversations at the foot of any page in this workshop. This entry was posted in Learning to play, Meetings and tagged collaboration, EMAP, Euterpe, Pydna, Ur. Bookmark the permalink.